The original drum, number 81171001, is on the left. V2 Drum, part number 81173001 is on he right. You’ll notice two primary differences. The first is the shape of the two “ears”. This feature is where the chains wrap farther around on the V2 and why the V2 chains are longer. This longer wrap of cable reduces the angled load where the cable meets the threaded connection fitting. Another change is where the Hobie logo is on the V2. 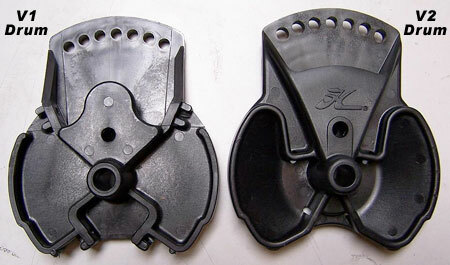 There is more plastic added higher up in this area to provide additional support to the pedal arm. V2 Drums offer a stiffer pedal shaft connection and better chain longevity along with many other refinements.